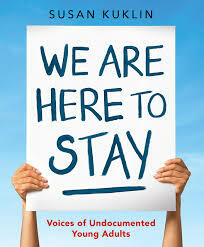 We Are Here To Stay is a no-frills collection of interviews that gives voice to young immigrants affected by the precarious renewal of Deferred Action against Childhood Arrivals (DACA). It's not an easy read but it's certainly an important one. We meet immigrants from Mexico, Samoa, Korea, and Ghana. We Are Here To Stay sheds light on the various reasons families come and stay in America, while also displaying the diversity of the immigrant experience. I think the one thing that stood out is despite all the hardships, many of the individuals in this book still believe that America is the best place for them. Check out the audio review here!